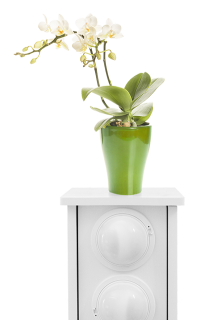 Smart Flower Stand is an inexpensive and inconspicuous monitoring solution that enables safe living at home at different stages of life. It monitors your loved one’s well-being daily and clearly indicates if anything is wrong. This enables improved, more affordable care work. With more information, you will worry less. The Smart Flower Stand system monitors the resident’s daily life and indicates, for example, if the resident falls over, becomes immobile, falls from the bed or exits the apartment. If problems arise, the automatic alarm system can contact the treatment chain quickly without the resident’s assistance. Smart Flower Stand is suited to people who live alone and are physically impaired, have been discharged from a hospital or otherwise require help in everyday life. Smart Flower Stand is easy to install and integrate into the decoration. This way, it is not associated with being monitored. A passive alarm system monitors the well-being of your loved one around the clock. The system protects privacy as it does not broadcast images. The care system indicates if the resident falls and can issue other alarms without the resident’s assistance. The alarms can be directed to the resident’s family, a service provider or a care organization through different terminal equipment. The unit does not require separate alarm wristbands or other additional equipment. If necessary, a sound connection can be established with the resident. Smart Flower Stand can be customized according to the user’s needs. An almost unlimited number of other everyday systems, such as a fire alarm, a stove guard, a leakage alarm or a thermometer, can be integrated into the system. The unit allows for better use of time and eliminates unnecessary travel costs. If problems arise, the smart alarms can contact the treatment chain quickly, thus reducing reaction velocity. Over 30 serviced residences and hundreds of homes use the Smart Flower Stand system. It is a smart, simple and effective system intended to assist residents, care personnel and the resident’s family alike. Commission Smart Flower Stand. We will arrange everything for you. Dial +358 45 773 11950. Download a brochure.